To Cite: Graham S, Harrod M, Iversen J, Simone Hocking J. Prevalence of Hepatitis C Among Australian Aboriginal and Torres Strait Islander people: A Systematic Review and Meta-Analysis, Hepat Mon. 2016 ; 16(7):e38640. doi: 10.5812/hepatmon.38640. Context: Aboriginal and Torres Strait Islanders (Aboriginal) account for approximately 3% of the Australian population. They have the poorest health, economic and social outcomes. Higher notification rates of hepatitis C antibodies (anti-HCV) have been reported among Aboriginal compared with non-Aboriginal people. The identification of Aboriginal people in national surveillance has some weaknesses, with only four of the eight jurisdictions included in national reporting. To address some of these limitations, we aim to estimate the pooled prevalence of anti-HCV among Aboriginal people in Australia. Evidence Acquisition: We searched the databases: Pubmed, Web of Science and Informit, and the New South Wales and Northern Territory Public Health Bulletins. A study was included if it reported the number of Aboriginal people testing positive for anti-HCV and the number tested for anti-HCV. A meta-analysis by population-group was conducted if three or more studies reported a prevalence estimate. Variables included: author, year of publication, study design, study period, gender (female, male), age, population group (Aboriginal people in prison, Aboriginal people who inject drugs), number testing anti-HCV positive, number tested for anti-HCV and prevalence (%). Due to a long time period, we separated the studies estimating the prevalence anti-HCV among Aboriginal people in prison into two time periods, 1994 - 2004 and 2005 - 2012. Results: Overall, 15 studies met our inclusion criteria. Among Aboriginal people in prison, the pooled prevalence of anti-HCV was 18.1% (95%CI: 6.6 - 29.7). The pooled prevalence among Aboriginal people in prison was 25.7% (95%CI: 4.1-47.3) in studies published between 1994 - 2004 and 14.5% (95%CI: 1.7 - 27.3) in studies published from 2005 - 2012. The pooled prevalence of anti-HCV was 58.7% (95%CI: 53.9 - 63.5) among Aboriginal people who inject drugs and 2.9% (95%CI: 0.30 - 6.1) among Aboriginal people who did not inject drugs, however there was significant heterogeneity (I2 > 90.0%, P < 0.01). There was significant selection bias in the studies as most included individuals who inject drugs. Conclusions: Our analysis shows that the overall prevalence of anti-HCV was significantly biased towards people who inject drugs; resulting in an over-estimation of anti-HCV prevalence among Aboriginal people. Our review highlights that unsafe injecting is the main transmission route for HCV infection among Aboriginal people in Australia. In Australia, an estimated 80% of new hepatitis C virus (HCV) infections occur through unsafe injecting (1), and one in two people who inject have been exposed to HCV (2). If left untreated an estimated 15% - 40% of people living with HCV will develop hepatocellular carcinoma (HCC) (3). In 2014, there were an estimated 713,600 Australian Aboriginal and Torres Strait Islanders (Aboriginal); accounting for 3% of the Australian population (4). Compared with non-Aboriginal people, Aboriginal people have higher rates of chronic and communicable diseases, unemployment, lower levels of home ownership, school completion and life expectancy (4). Aboriginal people account for 27% of the prison population compared with 2.5% of non-Aboriginal people (5). As a result, the Australian government has released national strategies including the fourth national aboriginal and Torres Strait Islander blood-borne viruses (BBV) and sexually transmissible infections (STI) strategy, 2014 - 2017 (6). This strategy includes a number of targets including safer injecting practices, increased testing among people at risk of HCV infection and increased access to treatment for people living with hepatitis C. The incidence of HCC is estimated to be two to eight times higher among Aboriginal compared with non-Aboriginal people (7). An estimated 230,000 people in Australia are living with HCV, with Aboriginal people accounting for 8% of newly diagnosed cases of HCV in 2014 (8). The notification rate of newly diagnosed HCV among Aboriginal people increased by 38% from 119 in 2010 to 164 per 100,000 in 2014; in contrast among non-Aboriginal people the notification rate decreased by 15% from 41 in 2010 to 35 per 100,000 in 2014 (8). However, only four of the eight jurisdictions in Australia are included in national HCV surveillance when reporting notification rates among Aboriginal and non-Aboriginal people. In response to the emergence of HIV in Australia, the first needle and syringe program (NSP) was established in Sydney in 1986. NSPs were subsequently established in other cities and in regional areas; resulting in a national network of NSPs across Australia (9). By 1995, an estimated 15 million needles and syringe had been distributed nationally, with distribution doubling to 33 million by 2009 (10). The Australian NSP network currently includes ~75 primary outlets, 700 secondary outlets, ~200 needle and syringe vending machines and ~2,500 pharmacies (9). Between 2000 and 2009, an estimated 96,667 new HCV infections were prevented as a result of NSPs in Australia (11, 12). New interferon-free HCV treatments called direct-acting antiviral (DAA) have recently became available in Australia. DAAs provide three key benefits for people living with HCV compared to previous interferon-based treatments (13). These include, shorter treatment duration, a higher cure rate and fewer side-effects (13). On 1st March 2016, the Australian government included DAAs on the Pharmaceutical Benefits Scheme (PBS) which significantly subsidises the price for people purchasing DAAs to as low as AUD $6.20 per prescription for people with low incomes (14). It is anticipated that universally accessible DAAs will lead to an increased number of people living with chronic HCV being able to afford treatment, increased access to treatment and completion of treatment (13). To date, estimates of the prevalence of anti-HCV among Aboriginal people have predominantly come from national surveillance and NSP surveillance data. NSP data only includes those who inject drugs and choose to access a NSP and national HCV surveillance data only includes HCV notifications from four of the eight jurisdictions of Australia due to some jurisdictions having limitations in identifying Aboriginal people. We aim to fill this gap in estimating the prevalence of anti-HCV and provide a description of the anti-HCV burden among sub-groups of Aboriginal people in Australia through pooling the prevalence from studies conducted in a number of jurisdictions in Australia. It will also provide an estimate of anti-HCV prevalence in Aboriginal people before the impact of DAAs has on new anti-HCV infections. This review was guided by the PRISMA statement (15). In September 2015, the lead author searched the databases Pubmed and Web of Science and then a searched for relevant articles in grey literature in the database Informit, the New South Wales (NSW) and Northern Territory (NT) Public Health Bulletins, the Aboriginal and Islander Health Journal and the 2010 - 2014 Australasian Viral Hepatitis Conference abstract Handbooks was conducted. The reference lists of the included studies were also examined for relevant papers. The search was conducted using title and keywords in Pubmed, Web of Science and Informit. Only manuscripts written in English were included. Information from each study was extracted by the lead author. The studies were then independently assessed by the last author for inclusion. Both authors discussed the included studies until a consensus was reached. A study was included if it reported the prevalence of anti-HCV in Aboriginal people in Australia. Studies that reported an overall prevalence of anti-HCV in Aboriginal and non-Aboriginal people combined were included if the proportion of Aboriginal people in the cohort was greater than 80%. The definition of Aboriginal people who injected drugs was if they have ever injected drugs. - Numerator = number of Aboriginal people who tested positive for anti-HCV. - Denominator = number of Aboriginal people tested for anti-HCV. For each study that met the inclusion criteria, information was extracted on: author, year of publication, study design, study period, gender (female, male), age, population group (Aboriginal people in prison, Aboriginal people who attended NSPs, Aboriginal adults, haemodialysis patients, people diagnosed with HCC), number testing anti-HCV positive, number tested for anti-HCV, prevalence (%), and 95% confidence intervals (95% CIs). If studies did not report 95% CIs, they were calculated by the lead author using the exact binomial method. Due to a long time period, we separated the studies estimating the prevalence of anti-HCV among Aboriginal people in prison into two time periods, 1994 - 2004 and 2005 - 2012 to examine if there was a difference in prevalence between the two periods. - I2 < 25%, fixed effects meta-analysis to estimate the common prevalence (95% CIs), assuming that all or most between-study variability is due to chance; or I2 > 25%, random effects meta-analysis to estimate the average prevalence (95%CIs). To assess publication bias we used Egger’s correlation test by regressing prevalence by its standard error and calculated the prevalence and 95% CIs. An assessment of within study bias (selection, measurement and confounding) (17) was undertaken to examine the potential effects of bias for each individual study. Data were analysed using Stata 13.0 statistical software (Stata corporation, college station TX) and Microsoft Excel 2010 (18). The study inclusion process is presented in Figure 1 and the included papers are summarised in Table 1. Overall, 15 studies were included, three cohort and twelve cross-sectional studies (19-33). A total of two studies were among adults(28, 31), eight among prisoners (19, 20, 22-24, 29, 32, 33), three among PWID who attended NSPs (21, 25, 27), one among people who were haemodialysis patients (26) and one among people diagnosed with HCC (30). There was one study conducted in remote areas (28), two in regional (22, 24), two in urban areas (21, 31) and ten studies were national analyses or included multiple geographical locations (19, 20, 23, 25-27, 29, 30, 32, 33). Of the 15 studies, ten studies reported anti-HCV prevalence by Aboriginal status (19, 20, 22, 23, 25, 27-30, 33) and four reported the proportion who had ever injected drugs (21, 23, 25, 27). Overall, 11 of the 15 studies included individuals at high risk of HCV infection such as Aboriginal people who inject drugs and Aboriginal people in prison (19-25, 27, 29, 32, 33). NSW, New South Wales; NT, Northern territory; conference abstracts, Australasian viral hepatitis conference handbooks; NSW/NT PH bulletins, new south wales/northern territory public health bulletins; aboriginal and islander journal, aboriginal and islander health journal. A total of eight studies reported a prevalence estimate in Aboriginal people in prison; with a total sample size of 5,234. The pooled prevalence was 18.4% (95%CI: 8.0-28.8); however there was significant heterogeneity in each population group (I2 = 98.8 %, Figure 2). There were 343 individuals included in studies conducted between 1997-2004 and 4,891 in studies conducted between 2005-2014. The pooled prevalence was 25.7% (95%CI: 4.1 - 47.3) in studies published between 1994 - 2004 and 14.5% (95%CI: 1.7 - 27.3) in studies published from 2005 - 2012; however there was significant heterogeneity among Aboriginal people in prison between the two time periods (I2 = 98.8%, Figure 2). Overall, four studies reported the prevalence of anti-HCV among Aboriginal people who inject drugs and one among Aboriginal people who did not inject drugs; with a total sample size of 1,703 (1,563 Aboriginal people who inject drugs and 140 Aboriginal people who did not inject drugs). The pooled prevalence of anti-HCV was 58.7% (95% CI: 53.9 - 63.5) among Aboriginal people who inject drugs (I2 = 19.3%, P = 0.29). There was evidence of publication bias in estimating the pooled prevalence of anti-HCV (odds ratio: 0.24 (95% CI: 0.04 - 0.44, P = 0.02). An assessment of bias (selection, measurement, and confounding) is summarized in Table 2 Appendix 1 in Supplementary File provides a detailed assessment of within study bias. Overall, seven of the 15 studies reported response rates (19-23, 27, 33), which ranged from 28.0% to 95.4%. As a result this increases the risk of non-response bias especially among high risk individuals. These four studies did report the reasons why the participants refused to participate, including: being uncomfortable with needles and among Aboriginal people in prison; a fear that the blood test would be used to detect drug use. Seven studies had a sample size less than 400 (21, 22, 24, 26, 27, 29, 30), reducing the representativeness of these studies and potentially increases sampling variability when estimating the pooled prevalence of anti-HCV. There was a high degree of selection bias in nine studies as they included populations at high risk of HCV infection (Aboriginal people in prison and Aboriginal people who inject drugs) (19, 20, 22-25, 29, 32, 33). There was a high degree of confounding among studies of Aboriginal people in prison because they do not have access to harm reduction programs such as NSPs; potentially increasing the risk of unsafe injecting behaviours. aJudgment: Risk of bias, + = Low, ++ = Medium, +++ = High. bA more detailed description of bias for each study is included in Appendix 1. Our review highlights that studies examining the prevalence of anti-HCV were significantly biased towards studies that included people at high risk of HCV infection. The highest prevalence estimates of anti-HCV were among Aboriginal people who inject drugs. As a result this study represents the prevalence of anti-HCV among Aboriginal people with a high risk of anti-HCV infection instead of the overall anti-HCV prevalence among the general Aboriginal population. 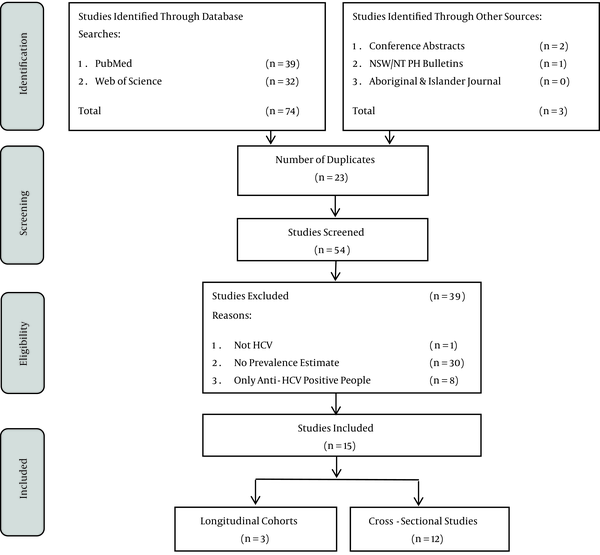 To our knowledge, this is the first systematic review and meta-analysis examining the prevalence of anti-HCV among Aboriginal people in Australia. A number of limitations should be considered when interpreting our results. Firstly, the majority of the studies were among Aboriginal people in prison or Aboriginal people who inject drugs. This significantly increases the risk of our study over-estimating the pooled anti-HCV prevalence among Aboriginal people. Also, among people in prison there is a higher risk of HCV exposure through unsafe injecting and unsterile tattooing (34). There is a potential increase risk of selection bias for one of the studies which included Aboriginal clinic attendees for two reasons; firstly, the individuals that were tested have sought health services and secondly, those tested for anti-HCV could have identified themselves as being at high risk of HCV infection and therefore a test was conducted which is recommended by Australian HCV guidelines (35). As a result, this study could represent the prevalence of anti-HCV among Aboriginal people with a high risk of anti-HCV infection instead of the overall anti-HCV prevalence among the general Aboriginal population. There was significant heterogeneity between studies (I2 > 95%) reducing the reliability of the pooled estimates in our study and our assessment of between study bias found evidence of publication bias (P = 0.02). These limitations suggest that our results are generalisable to Aboriginal people at high risk of hepatitis C infection and not Aboriginal people at a population level. A meta-analysis of risk-behaviour could not be conducted as only one study provided an estimate comparing Aboriginal people who inject drugs with Aboriginal who did not inject drugs. In our study, the prevalence of anti-HCV among Aboriginal prisoners was 18.1% which is consistent with a 2010 study of Australian prisoners where the age-standardized anti-HCV prevalence was 23.2% (36). We also found that the prevalence of anti-HCV among Aboriginal people in prison decreased from 25.7% between 1994 - 2004 to 14.5% between 2005 - 2012. However, this likely reflects changes in patterns of incarceration, particularly among people who serve short terms sentences and are in and out of prison frequently and access NSPs while out of prison. Also there has been no policy shift to prevent HCV transmission occurring within prisons in Australia including no NSP or harm reduction programs have been implemented. 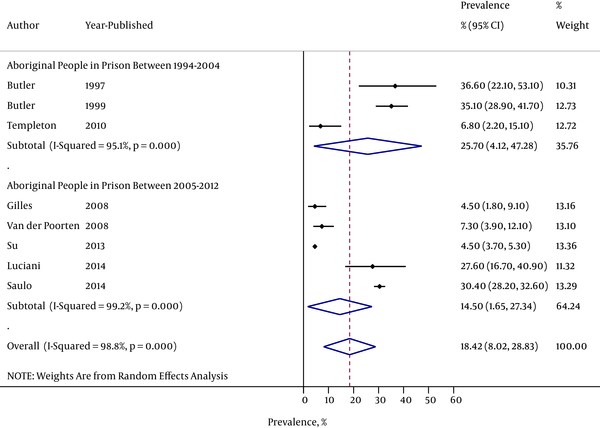 A survey of 618 Australian prisoners documented an anti-HCV prevalence of 55.1% among prisoners who reported a history of injecting drugs (36), suggesting that anti-HCV infections are related to unsafe injecting practices rather than imprisonment. The highest anti-HCV prevalence in our study was among people who inject drugs (58.7%). In 2013, the Australian National Needle and Syringe Program Survey (ANSPS) reported that 14% of respondents were Aboriginal (9); with 52% testing positive for anti-HCV (9). The ANSPS also highlights that approximately 45% of attendees reported ever being in prison (9). Another factor impacting our results is that although Aboriginal people account for an about 3% of the Australian population, they account for an estimated 27% of the prison population (37). The risk of HCV transmission in prison is increased due to NSPs not being available in Australian prisons. This highlights that unsafe injecting practices and being in prison can increase the risk of HCV transmission and the importance of NSPs as a prevention strategy. The impact of new DAA treatments becoming available through the PBS in Australia could be significant. Including DAAs onto the Australian government’s PBS will result in a greater number of people living with HCV be able to access and afford treatment. Promoting DAAs to people living with HCV is important so they can make informed decisions about where to access treatment, costs and support while on treatment. Although this provides an exciting prospect for people currently living with HCV; continued efforts must be maintained in preventing new HCV infections through NSPs and advocacy efforts to prevent HCV transmission among people in prison. The prevalence of anti-HCV was highest among Aboriginal people who inject drugs. More population-based studies are needed to estimate the population prevalence of anti-HCV among Aboriginal people in Australia. As most of the studies included these two higher risk groups, this analysis over estimates the anti-HCV prevalence among Aboriginal people and does not provide a pooled prevalence among the general Aboriginal population. As a result, our study provides an anti-HCV prevalence among two high risk groups, Aboriginal people in prison and Aboriginal people who inject drugs. In Australia, prevention strategies such as NSPs have proven highly successful in preventing new HCV and HIV infections but further advocacy is needed of NSPs for people in prison. This review provides a baseline of anti-HCV prevalence among Aboriginal people who inject drugs and could be used to measure the impact of DAAs on new HCV infections among Aboriginal people in prison or who inject drugs. Simon Graham is an Aboriginal Australian. All authors acknowledge the contribution Aboriginal and non-Aboriginal people make in providing medical, allied health and health education to Aboriginal Australians to improve their health and well-being. None of the authors have conflicts of interest to declare. Authors’ Contribution: Simon Graham contributed to the study concept and design, conducted the search, the analysis, interpretation and subsequent drafts of the manuscript. Mary-Ellen Harrod, Jenny Iversen and Jane Simone Hocking contributed to the writing of the manuscript and interpretation of the results. Funding/Support: Simon Graham is supported by a McKenzie postdoctoral fellowship and by the Melbourne Poche Centre for Indigenous health at the university of Melbourne. Jane Simone Hocking and Jenny Iversen are supported by Australian government national health and medical research council fellowships.